Summary: Chance of seeing severe weather in the afternoon and evening. Greatest risk remains east of us, but warrants attention for us due to uncertainties. The SPC has just released their Day 1 outlook and has moved us out of the ENHANCED category for severe weather and into the SLIGHT risk. Yes, this is a downgrade from a 3 out of 5 to a 2 out of 5. 15% chance of seeing damaging winds of 58mph or greater. 15% chance of seeing hail 1 inch in diameter or greater. 5% chance of seeing a tornado. Note: they have removed us from the “significant” severe weather threat (or the hashed area for those familiar with the SPC outlooks). Just because our risk has been *slightly downgraded* does not mean your weather awareness should be downgraded. Storms will form on top of us, so it’s important to be prepared. The next update to this outlook is expected at 8am Wednesday. I would not be surprised if the lines drawn in the map shift some (either more or less severe for us), as 7 hours from now the SPC will have a better idea of what’s starting to develop and how things are shaping up. 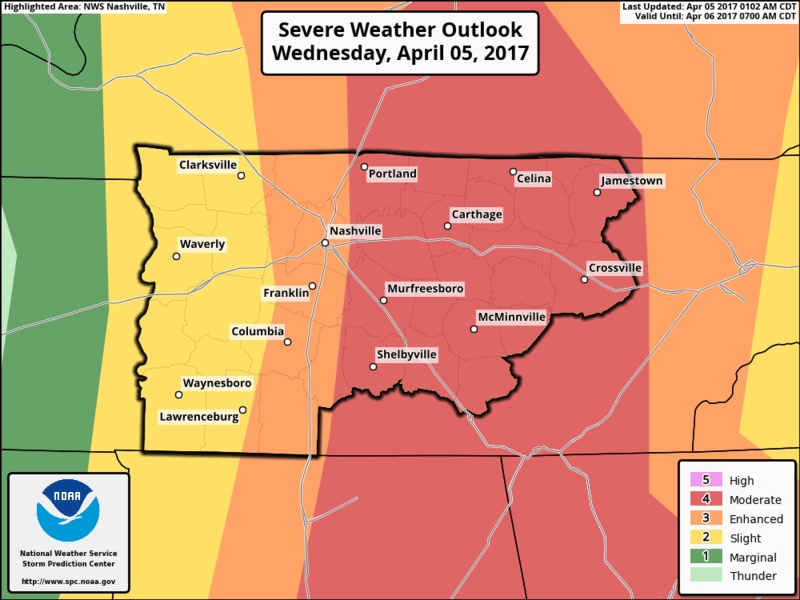 Wednesday is shaping up to be our sixth severe weather event since March 1st. No doubt this has been an active severe weather season, but we are having to keep our eyes on the weather once again as we go throughout our Wednesday. Below is a detailed overview what what to expect, but be sure to read the uncertainties also detailed below. 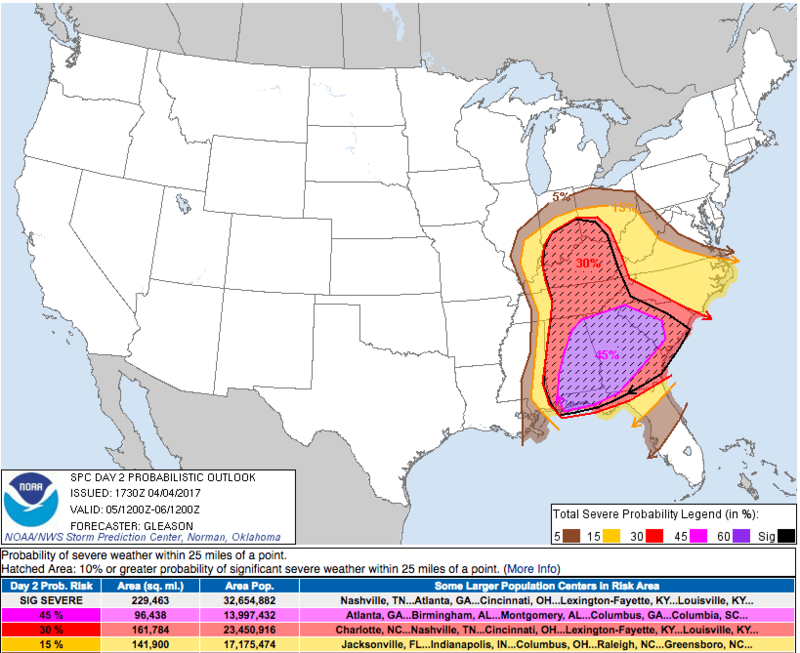 The Storm Prediction Center (SPC) has issued their Day 2 outlook that covers from 7am Wednesday through 7am Thursday. 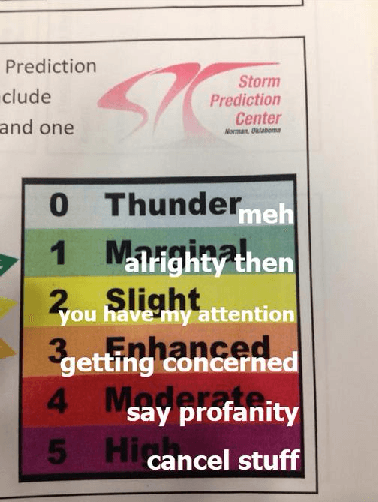 Since this morning, they have shifted us from SLIGHT (2 out of 5) to ENHANCED (3 out of 5) on the severe weather risk scale. The SPC has the line drawn through our county, but for the sake of brevity and because storms don’t stay neatly inside these lines, I’m counting us as in the ENHANCED category. Here’s another interpretation of the severe weather risk. With the ENHANCED severe weather risk, the SPC has placed us within a 30% chance of seeing severe weather (damaging winds 58mph or greater, hail 1 inch in diameter or greater, or a tornado) within 25 miles of a point. What has us watching the weather is the fact they’ve included us in the “hatched” area in their outlook, which means a 10% or greater chance of seeing significant severe weather (damaging winds 75mph or greater, hail 2 inches in diameter or greater, or a strong tornado of EF2 or greater). The greatest threats at this time appears to be large damaging hail and damaging winds, with an isolated tornado threat. This is a unique setup for us as most of the time, severe weather is either for us or for areas west of us. 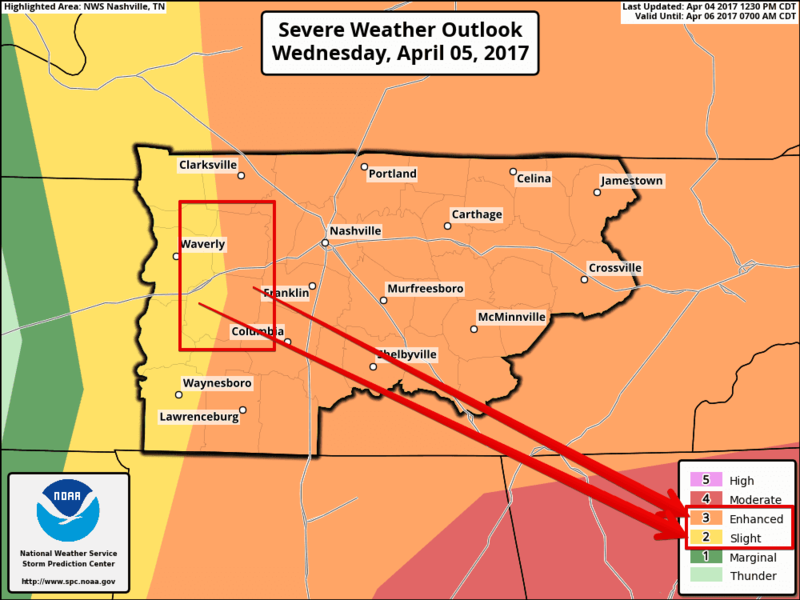 This time, it appears at the time of this writing that the worst of the severe weather in Tennessee will be east of I-65 and south of Tennessee into Alabama and Georgia. The reason is because the severe weather threat for Tennessee is likely to either develop on top of us or just west of us at the Tennessee River. If they do form either at the TN River or on top of us, they will strengthen, but likely not to a point where they will become particularly severe (meaning, super cells or tornados) for us. However, they will likely be strong to severe as they come through. This is the current thinking from NWSNashville – storms develop near the TN River and move east toward us, as they are moving east and then move away from us, they strengthen as they go. Thus, let’s look at the NAM3 model. Keep this in mind when looking at these models: The NAM3 is updated every 6 hours, so this is just the latest run at the time of writing, and is likely to change several times before the event arrives. At 4pm is when the NAM3 believes we may start having some storm activity. This is likely from storms that develop at the Tennessee River and start marching east toward us. 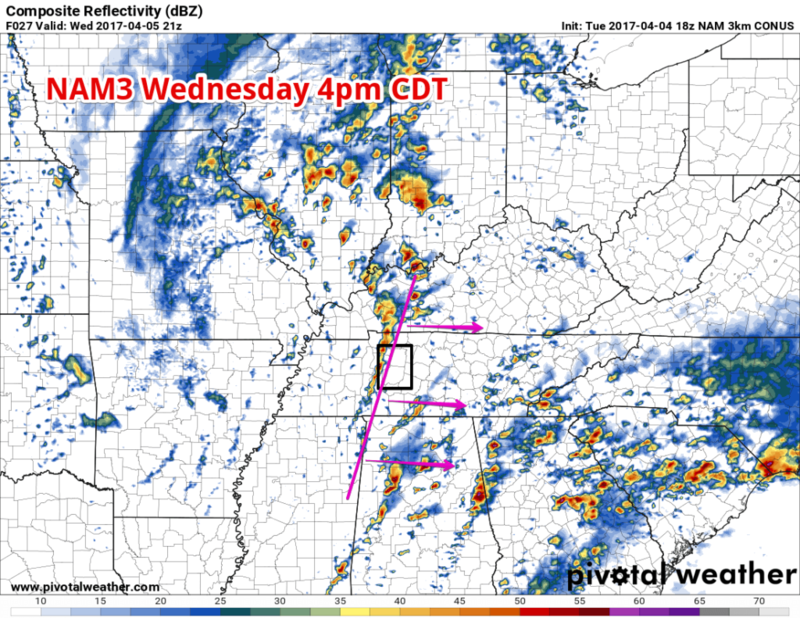 Here’s NAM3’s simulated radar for 4pm (we are in the black box, the line of storms dictated by the pink line). This is the one and only line currently that we will be watching. There may be some minor showers before and after this line, but as for the strongest part of the storms, this is the only line. 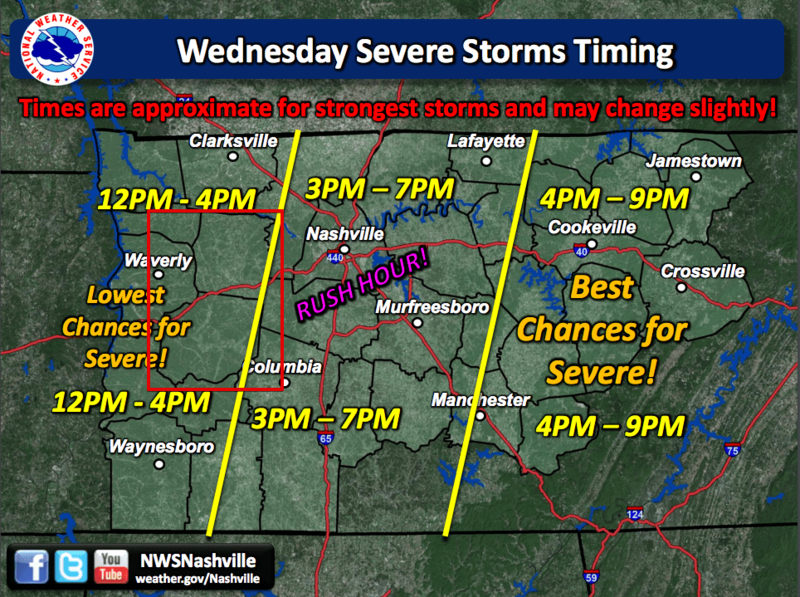 NWSNashville has released this timing graphic for us. Why will the storms wait until the Tennessee River to start flaring up? 1.) This is when the front will likely be coming through and 2.) There’s no storm fuel (CAPE, convective available potential energy) until the afternoon. Let’s discuss that CAPE (no, not what Batman wears). NAM3 is indicating virtually no CAPE in our area at 10am and shows our dew point at 54 degrees. For storms to start forming, CAPE should be about 1000 j/kg and the dew point at least 60 degrees (these aren’t exact numbers, but rules of thumb). 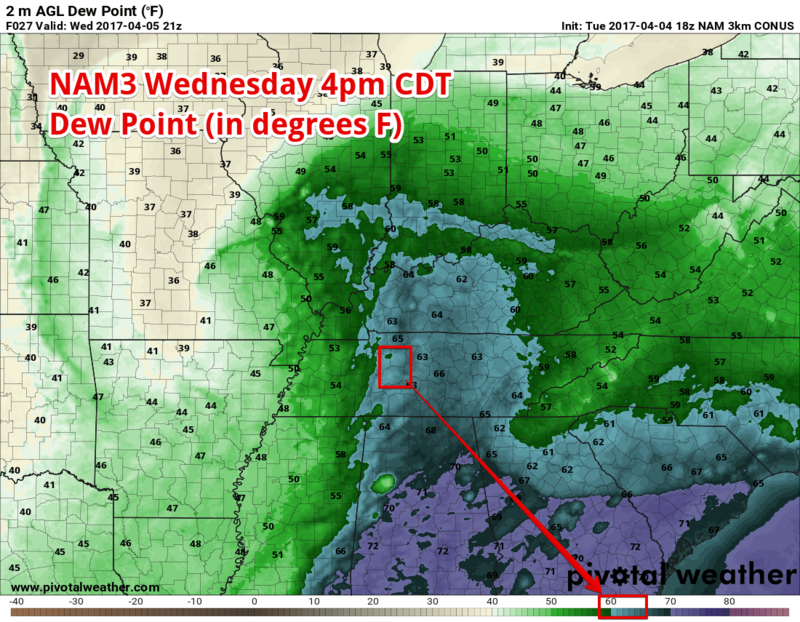 When you have CAPE above 1000 j/kg and dew points of 60 or higher, that’s when severe weather is likely to happen when there is something to stir it all together (a cold front). So, the NAM3 has our CAPE at 0 j/kg and dew pint at 54 degrees at 10:00am. This is good news if you don’t want severe weather. The NAM3 however shows a changing, unstable atmosphere starting to form between 10am and 1pm, showing our CAPE at between 1500-2200j/kg and our dew point roughy 62 degrees. 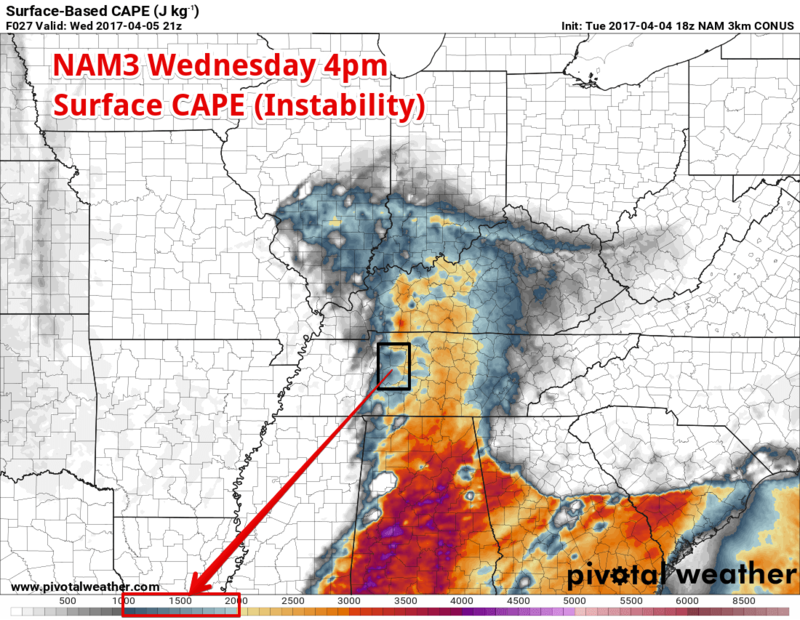 The NAM3 continues to show instability increasing as we get to 4pm, when NAM3 indicates we should start seeing storms. The thing, however, is that it shows instability increasing east of us. NAM3 at 4pm shows CAPE slightly lower (because the storms are eating it up as they move through) but our dew point slightly higher. Unfortunately, the NAM3 only gives us “snapshots” in three hour increments, and we will have to wait until tomorrow to get a more hour-by-hour snapshot from the HRRR model. 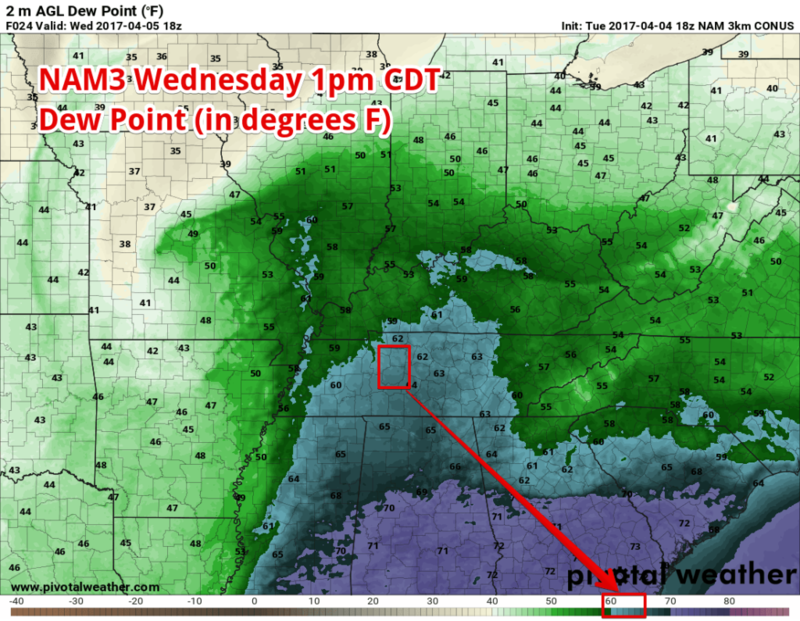 With the CAPE and dew point in range for severe weather, there will be some storm fuel to help get these storms going. However, the storms won’t have enough time to basically eat up the storm fuel before it effects us, which is why the worst of the threat of severe weather is east of us, as the storms have more hours to eat up the storm fuel and grow than they do before they impact us. Will the storms be strong for us? Most likely. Will the storms be severe for us? Somewhat likely. Will the storms be significantly severe for us? Possibly, but not as likely. With any good forecast, there must be expression of confidence and uncertainty. Let’s start with the confidence. 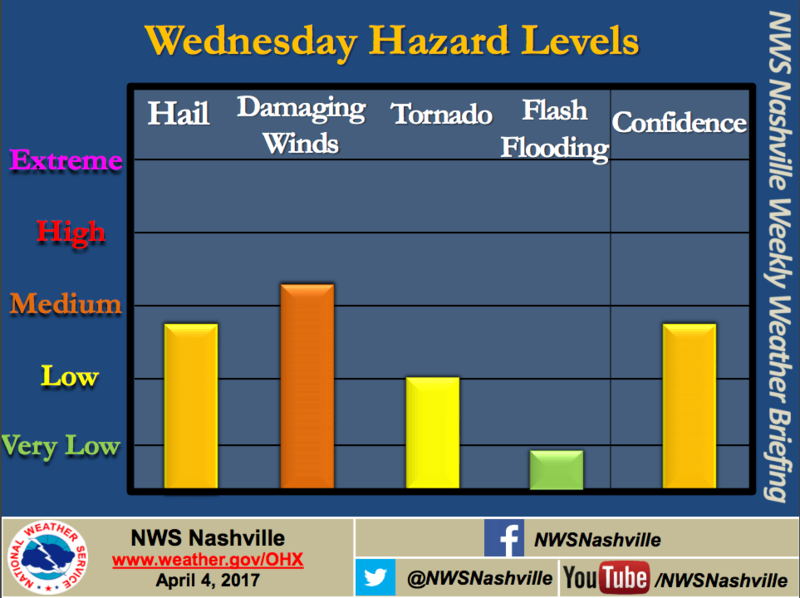 NWSNashville, in its hazards graphic posted above, stated that their confidence is around the middle of the range. This means they are confident we will see something, but when, where and how bad is still up in the air a bit. Uncertainties with this system are higher than we’ve experienced in the past, and even more so for us being on the western edge of this system. One big uncertainty is if the storms even develop at the TN River. 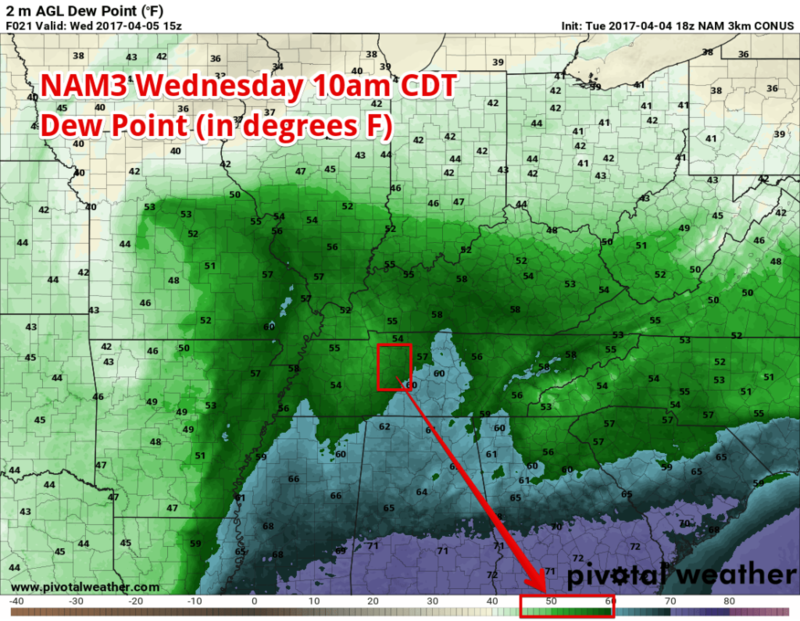 There’s limited CAPE and dew points (outlined above) when the storms are forecasted to develop, so they may not have enough to even get going until the system is more into our county (meaning, the storms could very well form on top of us). 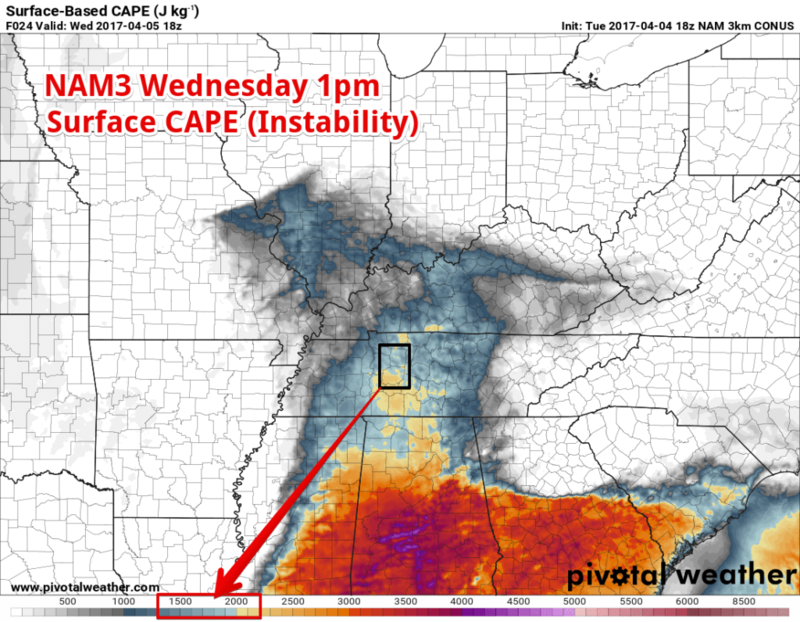 If the storms are starved for CAPE and moisture, then they will likely not form until they are on top of us. If that is the case, they won’t be as severe, but still strong and warrant attention. If they do form around the TN River, then they could start strengthening by the time they get here (as is what is currently forecasted). Another uncertainty is with the convection (storms) to our south during the morning. Could they help stop/slow down the flow of moisture from the Gulf? Will they clear out sooner than expected, opening the gates for even more moisture than anticipated? 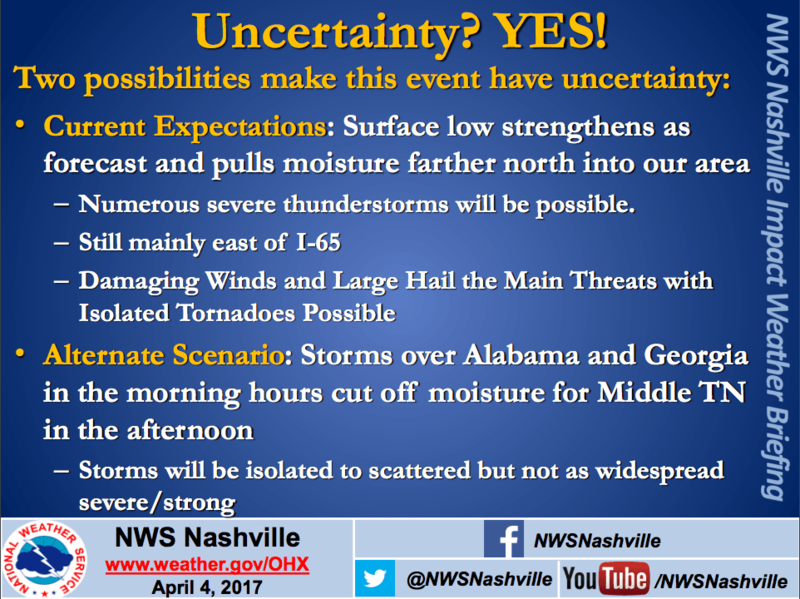 This will certainly be watched, and is an uncertainty that NWSNashville as expressed to partners today. It’s going to be one of those days where you want to be weather aware. It’s very possible that the SPC shifts the risks west come Wednesday morning, putting us in an even more chance of seeing stronger storms should the models trend that way. They could even pull us out completely of the ENHANCED and drop us down to SLIGHT. We won’t know until 1am. 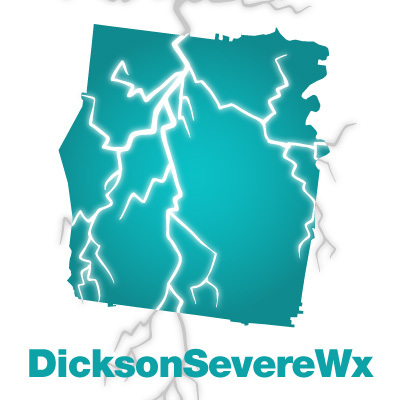 We’ve been through this every week for the last 6 weeks – stay weather aware, prepare, and watch the weather forecasts and meteorologists. I’ll update this post if/when possible should things change.